Oh wait. Since March viewers and fans have known that Trevor Noah will sit at the Daily Show Desk. Will that mean an end to Stewarting? What is Stewarting? The same question filled my mind when Natalie mentioned it to me. Rather than engage in the practice, she pointed me to the place where she read about the practice. One recent illustration came when many in the Southern Baptist Convention agreed with Russell Moore, President of the Ethics and Religious Liberty Commission of the SBC, called for the removal of the Confederate Flag. Many African-Americans have been calling for an end to the symbol of slavery and oppression under the guise of States’ Rights. Hearing from Russell Moore carried more weight with the largely white denomination than calls by those of Color. It would be dreaming to think the practice @thetrudz describes as Stewarting will come to an end. What will be different is the source. Let’s see how many Noah videos go viral spurred by that same Anglo audience. Stewarting illustrates the way access works. Something profound and insightful might arise from the margins, from those not controlling the discourse. No one notices. When the same thoughts reach those with a platform it is as if the insight is now original. Natalie appreciates Scot McKnight for giving space to women on his ever popular blog. Her point is but one piece of advice for those interested in avoiding Stewarting others/Others. Intentionally follow the blogs of a diverse group of people, follow those not like you on Twitter, look for those with a different social and ethnic experience to follow of Facebook, even fried them. Then, listen. Another subject to which I had to become familiar in my conversation with Natalie was derailment. My best approximation is shifting the subject. 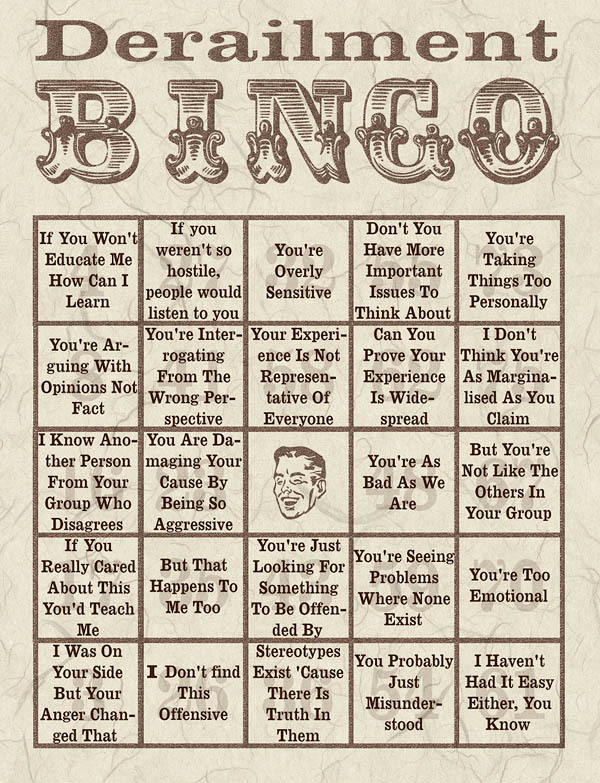 Here is a Bingo Card created to illustrate all the ways derailment is practiced. How many times have you engaged a conversation only to experience derailment? Pay attention to how you may often shift the subject. We might get further in our work together on difficult subjects if we would stop derailing others/Others. Why interview Natalie? Listen and I think you will understand. Subscribe to the podcast in the right sidebar. Choose iTunes or Stitcher. If you like what you hear, leave a review.